Update: Chromecast has finally hung up its hat. Google has manufactured a new Chromecast, and it's faster, smarter and more integrated than the original. Here's our review of the Chromecast 2. The diminutive package is Google's answer to products like Apple TV, Roku 3 and the Amazon Fire TV – all of which are designed to take your digital content and streaming services like Netflix, Sling TV and Amazon Prime Instant Video and get them up on your big screen without fuss or fiddle. But whereas the competition uses fancy interfaces to hold content and run on complex operating systems, Google's little streamer is content just sitting there and waiting for your other devices to tell it what to stream. More impressive, though, is its price. From day one the Chromecast wowed with its cheap price and it can now be had for as little as $32. It's similarly bargainous in the UK: just £30 - less than a third of the Apple TV's RRP. 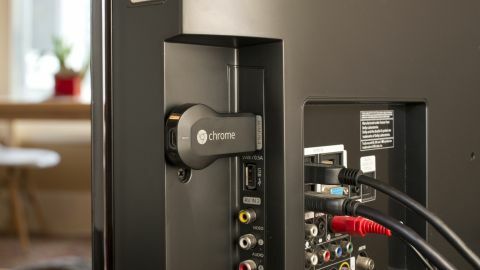 What's new with Chromecast? Chromecast is getting a $15 ethernet adapter! Most of the big hitting services are now compatible, with Netflix, YouTube, Vimeo, Hulu Plus, Pandora, HBO Go, Starz and Showtime Anytime etc... all ready and waiting in the US, and BT Sport, BBC iPlayer and more in the UK. You can find a complete list of Chromecast-compatible apps on the Google Chrome Store. Music is really restricted for UK users, with even the lone Pandora app support no good for us due to licensing restrictions. The key addition here would be Spotify, but there's a wide range of services that could become available. The truth is that the 'casting' method of getting video onto your TV is simply not very compatible with music. We're sure that this will change (Google can be very persuasive…), but there are major limitations on built-in support at the moment. Google's Chrome browser on Mac or PC lets you mirror a browser tab to your TV, meaning that you can theoretically send any of these services to your TV that way, but there are issues with this. But if you mirror a browser tab, you're effectively streaming video to your computer from the internet via your router, then streaming it back to your router and then streaming it out once more to your TV, resulting in heavy network traffic. Using Chromecast, though, it's clear that it's designed for use with portable devices in mind. You won't find a Chromecast remote in the box or a main menu tying all of the apps together like on an Apple TV or Roku 3. Recent firmware updates have soothed this problem giving users the ability to use their TV remote to control some functionality, but at the end of the day you'll still need to keep a device running the app within arm's reach. All streams originate from a special "Cast" button that's built into each compatible mobile app - your device is the remote. Currently, Windows Phone 8 users, who don't have many options among app-filled streaming technology, are totally out in the cold for Chromecast support, with only third party YouTube app TubeCast being compatible. So Chromecast is only really suited to those with Android and iOS devices. The way Apple integrated its AirPlay streaming solution deep into iOS means that it inevitably has better support when combining an iOS device with an Apple TV, but as long as developers continue to use the Cast SDK, we will inevitably see almost as widespread support for cross-platform solutions - iOS, Android and Chromecast all working together seamlessly. Sure, Roku has its Roku SDK, but it's easier for many developers to make their apps compatible with the Android-based Chromecast. It requires a little bit of retooling rather than learning an entirely new ecosystem, as is the case with the Roku.